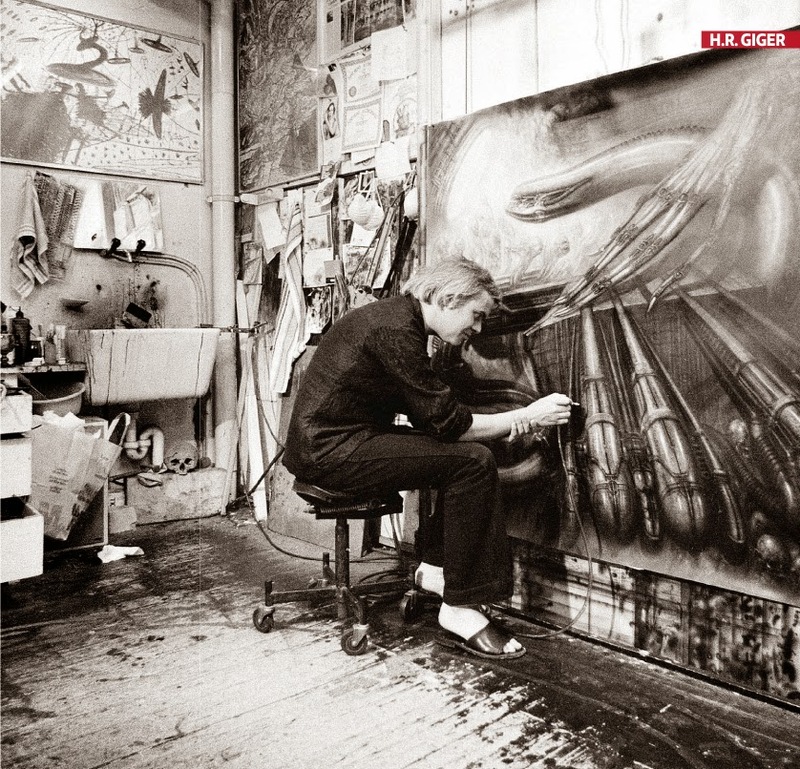 For many years since I bought a copy of Giger's Alien back in the late eighties, I have wondered about the painting HR Giger's Alien Monster III. I observed the serpentine vision of Giger's Alien creature coming out of a sacrificial stone, with octopus like suckers running along its grey translucent body with it's tale poking out through a blood drain down the corner. The thing stares at the light coming through the circular window and multitudes of decrepit gnome like lemures reminiscent of the clay sausages that HR Giger was known to have used in making the alien eggs and perhaps the alien nest as well. They are pouring out of the crevices to surround this trapped alien being, they swim through the air like a shoal of seahorses, they are there to hear its every utterance, and in this small world it rules. The worm like Alien is an ancient creature inhabiting the sacrificial chamber waiting waiting for an ageless time to make its escape as it bathes in the ethereal starlight. It might be something of great danger to others should be be released. A giant disconnected hand gives away the idea that this image is abstract are we talking about Cocteau or Picasso? The chamber would have been loosely inspired by the birthing temple interior described in Dan O'Bannon's original Alien script, seen also in Ron Cobb and Chris Foss's illustrations of the scene. Perhaps the plinth which the creature inhabits is triangular in shape. 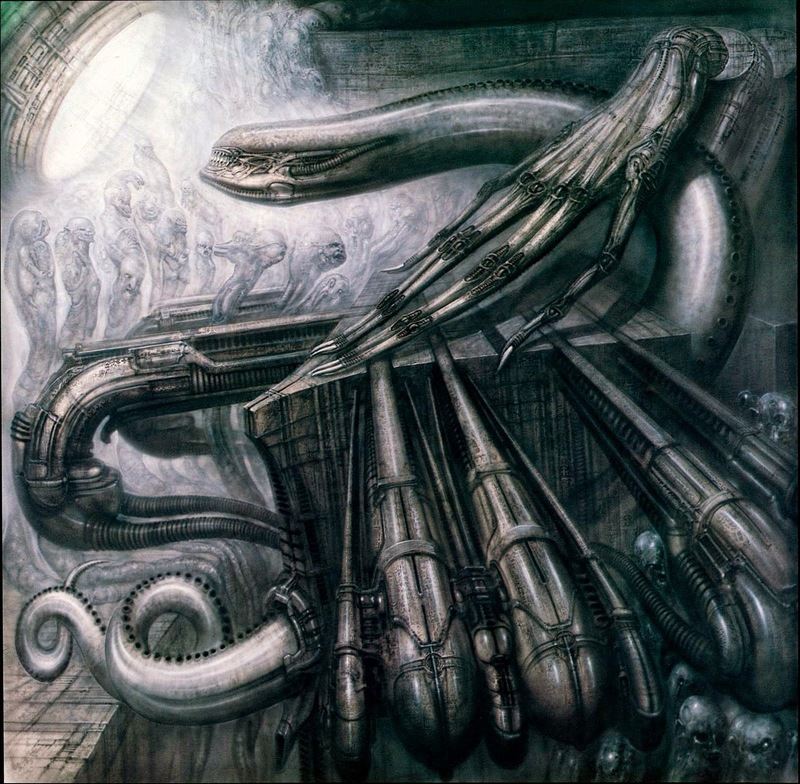 b) See: Giger's Alien Monster III, references Max Von Moos' "Devil's Kitchen (or Stalingrad)" ? c) See: Giger's Alien Monster III, Giger's Alien Monster III references the painting from "The Creeping Flesh"? 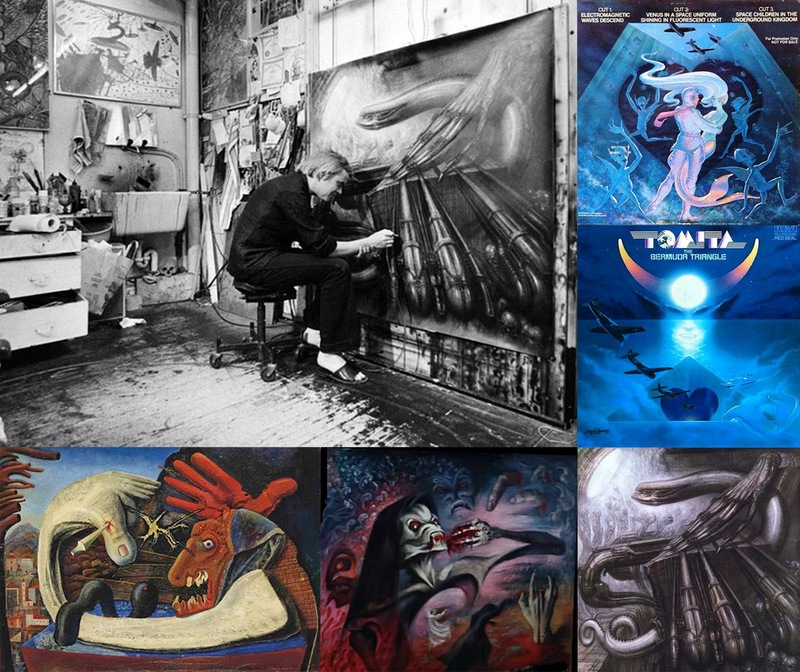 d) See: Giger's Alien Monster III references Tomita's Bermuda Triangle album cover?